Perhaps the first option for someone wishing to have whiter, nicer looking teeth, is to arrange to have them whitened. The teeth whitening procedure, available at The Dental Centre Bedford, is one of our most popular treatments, and with good reason. However, there are situations where a teeth whitening procedure would not produce the results required and dental veneers are often used where staining or discolouration is severe, or where significant chips or cracks are present. Dental veneers are constructed from porcelain or composite which is made into very fine layers, almost like false fingernails, that are used to replace either badly stained, chipped or cracked enamel from the front of your teeth. They can also sometimes be used to reduce the appearance of a diastema, or gap between the front teeth. In order to fit a veneer, it is first of all necessary to remove an equivalent thickness of the damaged or discoloured enamel from the front of the tooth. The prepared teeth are then scanned and the results fed to a computerised system known as CEREC. 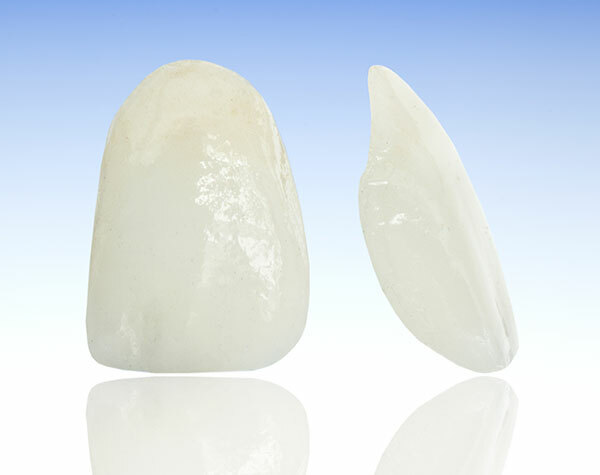 Unlike at many practices, where the veneers are manufactured off site, resulting in a wait of a week or more, our veneers are produced onsite using the CEREC system. This mills a veneer from a single block of porcelain, and is ready in approximately one hour. In some cases, the CEREC system may not be ideal but our dentists will inform you of the best treatment for you. The veneers are attached to the prepared teeth using a strong dental adhesive and are finally trimmed and polished for a natural, attractive appearance. With good aftercare, veneers should be expected to last for around ten years, bringing a beautiful new smile! Create a great new smile! For more information about dental veneers, or any of our cosmetic treatments, please call The Dental Centre Bedford on 01234 819868.